A robotic dinosaur clerk greets visitors to the Henn-na Hotel north of Nagasaki July 15, 2015. The budget hotel at the Dutch-themed Huis Ten Bosch amusement park is mainly staffed by robots. 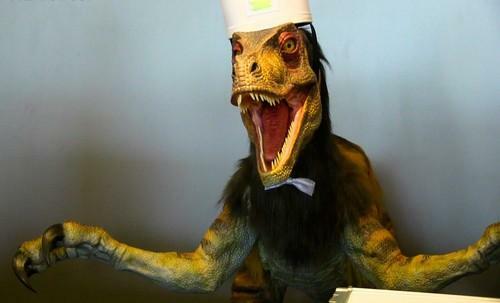 When you check into Japan's newest hotel, a mechanized velociraptor in a bellhop cap greets you at the front desk. "Thank you for your visitors," it says in awkward English, as it gesticulates with its alarming claws and fangs. If it's too off-putting, the other clerks, a female android in a crisp white uniform and Aldebaran Robotics' pint-sized Nao humanoid robot, are happy to check you in. Welcome to the Henn-na Hotel near Nagasaki, where the main staff are machines. The name means "strange" in Japanese, and the facility is a bizarre combination of a no-frills business hotel and an amusement park. At least part of that makes sense, as it's located in Huis Ten Bosch, a Holland-themed amusement park in Sasebo, north of Nagasaki City. As you'd expect, it has a range of gimmicks to entertain guests. At the entrance, a giant industrial robot arm supplied by Yaskawa Electric acts as a mechanized cloak room attendant for guests who want to see the theme park before or after their stay. When luggage is deposited into a receptacle in the wall, it whirls into action, picking it up and placing it in one of about 30 cubbyholes. As they register, guests can choose a keyless entry option. Facial-recognition cameras at the front desk register guests' faces, which can then be used to open the doors to guestrooms. In the lobby, another Nao robot stands on a pedestal acting as a robot concierge. It can provide information about the theme park in English and Japanese. Two porter robots made by Sharp, which look like large boxes on wheels, stand ready to carry luggage to the guestrooms. The hotel has been built with ramps that allow the robots to access the 72 rooms on two levels. Automation firm Murata Machinery is also developing a room service robot for the hotel that can bring amenities when summoned. The rooms themselves have a subdued minimalist design echoing the modernist look throughout the building, which was designed by Yoshiyuki Kawazoe, associate professor at the Institute of Industrial Science in the University of Tokyo. Sitting on a night table between the twin beds of every room is Churi-chan, a cartoonish communication robot with a pink head that resembles a tulip (in keeping with the Dutch theme). The bot can retrieve information from the Internet, such as the weather forecast, and tell the time, turn the lights on or off and wake guests up, all using its high-pitched "kawaii" (cute) voice. Equipped with vending machines that dispense hot dogs and rice balls, the hotel is all very automated, though of course not perfectly. During a press preview Wednesday, the cloakroom robot seemed to develop a sore elbow, so to speak, two of the Nao robots took a tumble from their pedestals and it was hard to ignore the rubbery jerkiness of the android and dinosaur, developed by Kokoro, a group company of Hello Kitty licensing company Sanrio. But it's all part of the awkward theater of spending the night in what feels like a set for a sci-fi B movie, with human support staff in the background. "Basically guests will see only robots, not humans" when the hotel opens on Friday, said general manager Masahiko Hayasaka. Announced in January, Henn-na Hotel is aimed at accommodating the burgeoning numbers of visitors to Huis Ten Bosch, which scored a profit in its 2011 fiscal year after going bankrupt in 2003. It's also meant to provide relatively cheap accommodation by keeping human staff to a minimum, Hideo Sawada, president of the theme park operator, said at a ribbon-cutting ceremony. Henn-na Hotel has an online auction system for rooms, with the minimum for a single room set at ¥9,000 (US$73). That's less than half the rate at the other hotels at the theme park (which start around ¥20,000 to ¥30,000). Aside from the use of robots instead of paid human workers for the main jobs, power-saving equipment such as LED lights and air conditioning that uses condensation panels instead of ventilation is expected to significantly reduce operating costs. The hotel is planning to open a second wing, also 72 rooms, next year, as well as a branch in central Japan. The company is also considering opening robot hotels overseas, Sawada said, without elaborating on possible locations. Tim Hornyak covers Japan and emerging technologies for The IDG News Service. Follow Tim on Twitter at @robotopia.